Spring Oak on the Eagles trail. 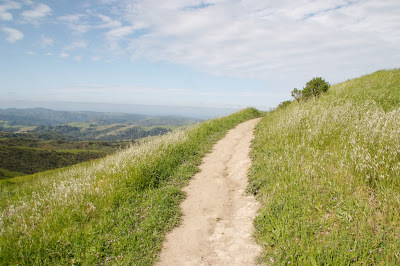 Windy Hill was given to the Midpeninsula Regional Open Space District in the 80's by the Peninsula Open Space Trust to celebrate the 15th and 10th anniversaries of the two organizations respectively. From the parking lot the preserve commands truly fantastic views of the grassy hills and valleys of the north Santa Cruz Mountains and the Pacific Ocean beyond. 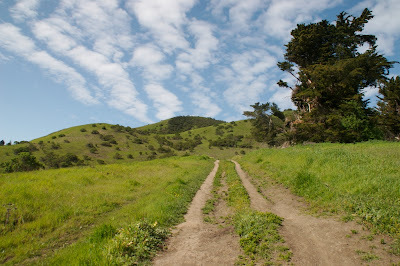 The anniversary trail starts out leading to the top of two small knobs rising above the nearby landscape. To the west, the mountains and the ocean, to the east, Palo Alto and the bay. Unfortunately as the Aniversary trail becomes the Spring Ridge trail the views taper off quickly after the two summits leaving a wide and exposed trail down the mountain. In the spring though the park does offer an incredible pallet of wildflowers. 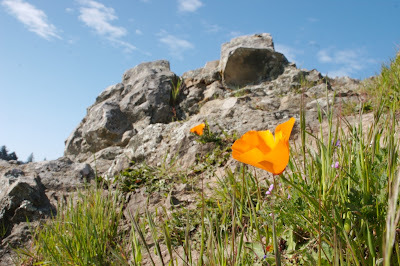 It does not have the painted slopes of Edgewood packed dense patches but is host to an unrivaled diversity of different species; Mission Bells, Hounds Tounge, California Poppy, Checkerbloom, California Buttercup, even Iris can be found in the park. A brief respite on the otherwise totally exposed Spring Ridge trail. After descending 800 or so feet the trail forks, keeping left on the Betsy Crowder trail extends the loop around Sausal Pond a habitat for Ducks, Heron, and Turtles that love to sun themselves on the banks. 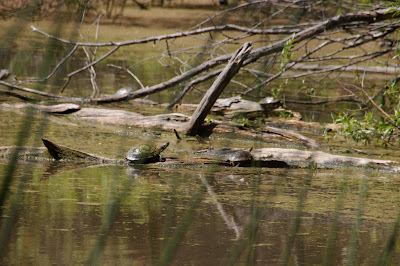 The pond is a habitat rehabilitation project though and consequently access is limited. Around the pond the trail becomes the Ridge trail which passes through some beautiful meadows and shady oak forests. 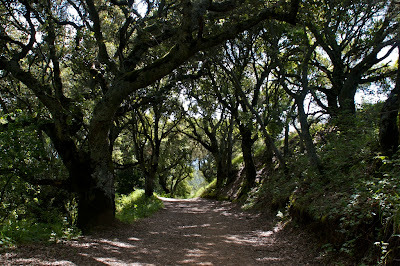 Here the trail also abuts the town of Portola Valley and civilization can be seen looming behind the tree line. As the trail veers back in towards the heart of the park, paralleling Alpine road the scenery dramatically changes. 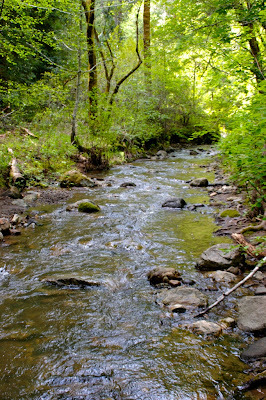 The oak forest gives way to a beautiful Riparian Gulch (Hamms Gulch I suppose). After crossing the creek several times the trail climbs along the canyon along the Hamms Gulch trail, switching back for several miles. It stays cool and shady down below the tree canopy even on a warm afternoon though the name for the park becomes apparent closer to the top. The wind comes in very strong over the ridge and through the trees as they begin to thin out around the top of the trail. The last 1/2 mile along the Lost trail becomes what I had expected from the name of the park. 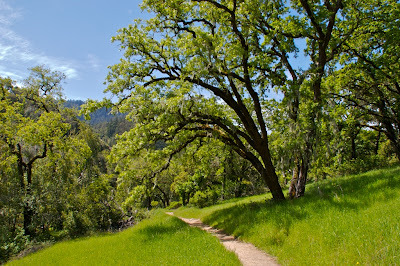 Gusts of breeze swaying grasses in the distance as the trail winds through shady forests studded with pretty wildflowers and old heritage trees. 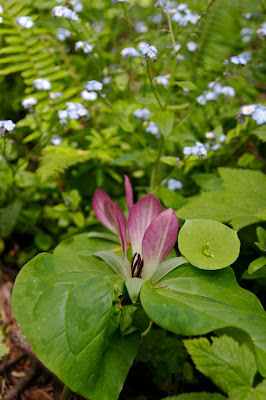 Wildflowers along Lost trail near Skyline Blvd.